The Breakfast Club is, without a doubt, one of my favourite films. I have seen it countless times, will likely watch it countless more, and would claim that it is a near perfect film, should such a thing exist. However, a new light has been shone on the John Hughes classic thanks to its star, Molly Ringwald, in her article for The New Yorker, where she highlights the sexual harassment her character experiences. Finding older films newly problematic is not a new experience, such as the rampant sexism in Alfred Hitchcock’s movies, or the racism in old Westerns. But over thirty years later, The Breakfast Club is still celebrated as an iconic eighties teen film, and its problems have gone unnoticed, until now. In her article, Ringwald takes a look at the treatment of her character, Claire, by the bad boy figure, Bender. On the surface, it would appear that Bender is just the troubled, tortured loner who lashes out at those around him, with Claire being no exception. His behavior is not depicted as acceptable or desirable, he is just another outcast, poorly navigating teenage life. However, watching The Breakfast Club in our contemporary political climate gives a new meaning to Bender and Claire’s interactions. In one particularly disturbing scene, when Bender is hiding under Claire’s desk, he looks up her skirt and it is implied that he touches her. We can see now, in 2018, Bender’s behavior is not just gross; it is sexual assault. Ringwald wrote that ‘What’s more, as I can see now, Bender sexually harasses Claire throughout the film. When he’s not sexualizing her, he takes out his rage on her with vicious contempt, calling her “pathetic,” mocking her as “Queenie.” It’s rejection that inspires his vitriol.’ Bender’s ruthless attacking of Claire throughout the film is appalling. What’s more appalling is that they end up together; not the kind of message you would expect from a John Hughes film. However, Ringwald is eager to defend this hiccup in Hughes film, putting it down to nothing more than ‘a glaring blind spot’ in his otherwise sensitive writing. Ringwald’s problem with the film is the impact that art can have on our attitudes, how much it can influence us, ‘If attitudes toward female subjugation are systemic, and I believe that they are, it stands to reason that the art we consume and sanction plays some part in reinforcing those same attitudes,’ Ringwald writes. So where do we go from here? How do we navigate between loving these works of art while simultaneously finding them problematic? 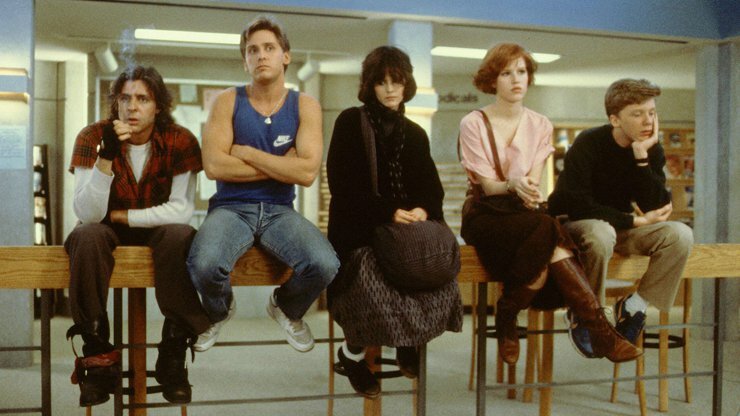 Ringwald’s article could teach us to recognize the problems with older films, without dismissing them entirely. The Breakfast Club will remain one of my favourite films. And though the next time I watch it I might feel even more opposed to Bender’s behavior than I did originally, the age of #MeToo ultimately does not diminish the film’s impact.